I Am Mike D: Happy Birthday Dad! This here is a picture of me, my dad and my sister from a couple years ago that I have always enjoyed. 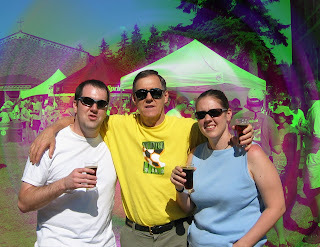 We were half tanked on 6oz tasters at the Beerfest. I was crouching to make him look taller and talking when dad's half tanked soccer buddy snapped the picture. I love it! Not only is today Groundhogs Day, it is his birthday. He'll probably kill me for saying so but he is now 67 years old! Nothing to be ashamed of when you look that good! He could easily pass for 50. Sad to say, but this guy could beat beat me in a sprint or marathon, no question. There was only a small window when I was fast enough to take him. Maybe late junior high until I discovered Seattle's micro-brews and he started playing soccer. Now before you think of me as some Jabba the Hutt, I recently beat a buddy in a 100 yard sprint for shotgun seat. Yes, I was sucking big time air, but I still got kick! I am pretty confident that I can take most 67 year old men (and women) in a sprint, but not this one. He gave me my goof-ball sense of humor. He started me out early reading the Sunday comics to me while we were eating one of his famous 'surprise' omelette's. (Like a box of chocolates you never knew what you would find in them) We then moved on to the Peter Sellers 'Pink Panther' movies. A favorite memory of mine is watching a show about dams with him. Every time they would mention the 'dam spillway', 'dam engineer', or 'dam' anything we'd be laughing uncontrollably. So much that the mother got irritated with us. It was simple and great. I enjoy having a brew (theme?) and conversation with him. We always end up having a good chuckle. Lucky for me he lives close enough that this is easy to do. That is a good picture! Happy Birthday Dad!!! Let us know if you saw your shadow this morning! Happy Birthday Uncle Gary!!! Love Ya!